No matter what brings you to paradise, Key West Hideaways has the perfect home for you. Be sure to check our SPECIALS PAGE for any seasonal specials on nightly rentals. No matter if you are coming to Key West for a long weekend, week-long stay, or month-long getaway, we offer some of the finest nightly and monthly rentals in town. Our vacation homes and condos are conveniently located around Old Town Key West. While some are close to Duval Street, others are on a quaint quiet lane in the heart of the island. The weather in Key West is warm and sunny nearly year-round. If you have more time, we offer weekly and monthly vacation homes with one, two, three, and four or more bedrooms. Many have gorgeous pools and lush tropical back yards. We can also help you host an entire group for a wedding or reunion of family and friends. Check out our group nightly rentals! We strive to make your trip to Key West a great one! We offer concierge services such as bike or scooter rentals, water sports, dinner/booze cruises, and tours. Break away from the standard hotel room and enjoy our properties with fully-equipped kitchens and lush back yards with private pools and hot tubs. All in the most desirable locations. Key West Hideaways is a full-service vacation rental and property management company. We offer superior service to our guests as well as our home owners, and strive to help you profit from your investment in Key West. To join our rental program, please contact us. There are many options for places to stay in Key West. Nightly vacation rentals are a popular option if you plan to just stay for a few days or a little over a week. 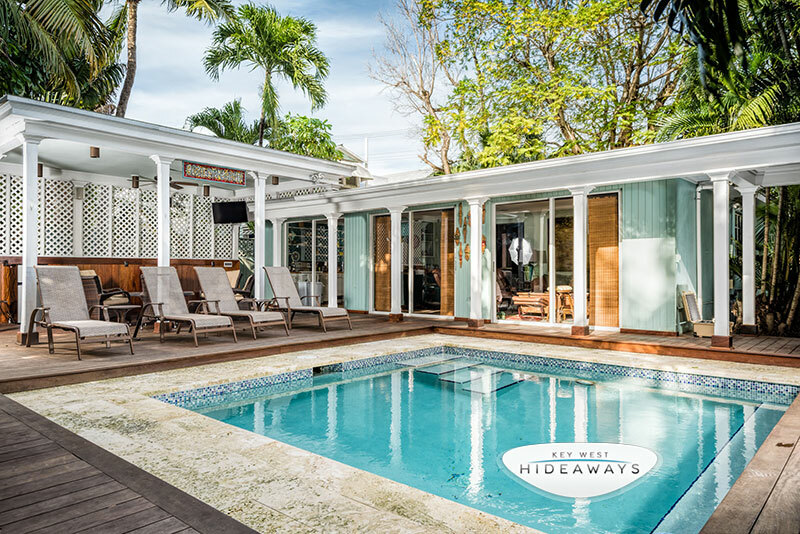 Key West Hideaways has vacation rental cottages, condos and homes available by the night throughout Key West so you can experience all the island has to offer. Looking to spend some quality time in Key West, a monthly vacation rental home or condo can be your home away from home. Choose from one, two or three bedroom Key West vacation homes to our more spacious four-bedroom rental homes. We can also accommodate larger groups or wedding parties. We think its important to be able to bring your pet along on vacation. Therefore many of our Key West vacation rentals are pet-friendly. Check with us if you have any questions about our pet friendly rentals or pet policies. We can help maximize your investment home in Key West! Key West Hideaways is the premier rental property management company in Old Town Key West. Our staff have the training and resources to offer each property owner and guest with a stress free beginning-to-end solution to renting and staying in the Florida Keys. We are here to manage every aspect of keeping your Key West vacation rental booked and ready for guests to enjoy. We want you to make the most out of your investment in the Keys without having to do the busy work involved with managing it. What that means for you is we take professional photos, write descriptions, and offer marketing to potential guests to fill your calendar. We also manage the logistics such as reservations, payments, check-in and check-out, housekeeping, light upkeep, and dispatch of any emergency maintenance. Let us help you arrange tours, trips, and activities!